EXCITING or what!!! 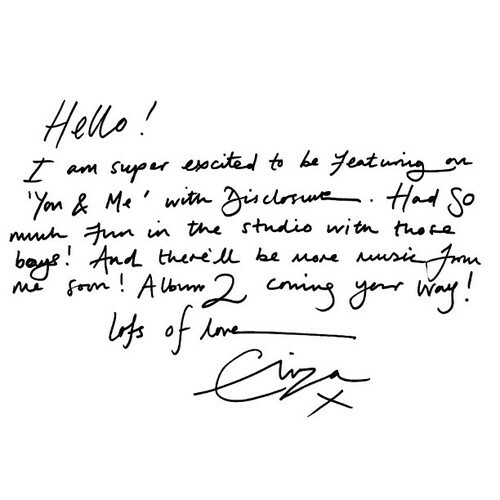 ‘You And Me’ is to be given it’s first play on Annie Mac’s Special Delivery on 19th April on BBC Radio 1 and will be released on 28th April. The track is also featured on Disclosure’s debut album ‘Settle’, which is due for release on 3rd June and features the smash hit ‘White Noise’ with AlunaGeorge and ‘Latch’ which features vocals from Sam Smith. In other news, Eliza has partnered with soft drinks maker Appletiser as she fronts the brand during a new campaign. Promotional packs come complete with an eight digit code which will enable you to enter a competition to win tickets to a secret and exclusive gig to be held on 20th June in London. More information here.